As part of our making our 101 Things Birmingham Gave the World book, we promised to make an ‘album’ – an album of 101 songs that Birmingham gave the World. Our rules were simple — the songs couldn’t have existed in this form without the city of Birmingham. That means Brummie songwriters, musicians, instruments, recording studios or subjects. Where the connections are a little more tangential, well we’ll let you work those out, and you can hassle us and each other in the comments. The other rule: it had to be on Spotify, so no Funky Moped, or Brummie moptops The Beatles. 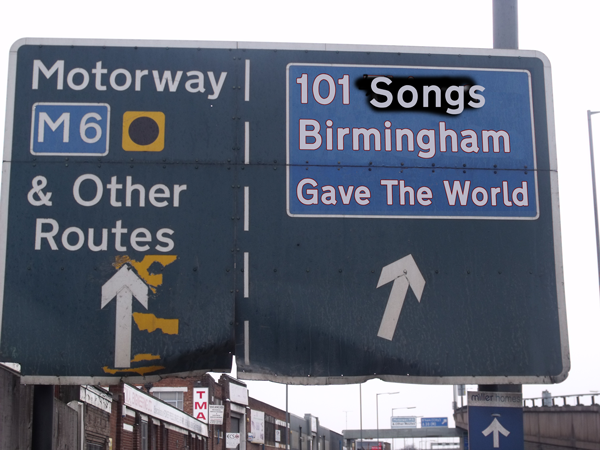 We’re not saying that it’s the best 101 songs that Birmingham has produced*, but it’s a fantastic 6 hour listen — and of course it will finish with Mr Blue Sky. 101 Songs Birmingham Gave The World: Now that’s what I call Paradise Circus. *It does contain the best song Birmingham has given the world, of course. But maybe not the worst.